Yes, whenever and wherever, natural light is my first choice for weddings—just like my portrait sessions outside. And, why not? We’re not limited, like we were on film, on our ISO choices. We have many choices on very fast lenses; our tools have never been better for wedding photography! Do I bring speed lights on my weddings? Of course, I bring two, for those situations mostly involving action, in low light, usually at the reception. As professionals we should be using the best light in any situation. If I have enough natural light, especially for portraits, that’s ALWAYS the best choice. If there’s no light, I’ll use flash, but never pointed directly at my subject. If there’s some nice low level ambient, for background color, but little on my subject I’ll “drag the shutter” and use indirect flash for a mixed effect. However, what I’m seeing way too often is photographers using flash EVERYWHERE and all the time! Using flash throughout the wedding creates a sameness to the look of the wedding; different light sources and different qualities of light add artistic interest to the bride’s album. One of the most often omitted or missed light sources, by many wedding photographers, is Window Light. This is truly shameful because there is NO Better portrait lighting for the bride than window light! It’s not like there’s a shortage of windows in homes or hotels. Since the invention of energy efficient, dual pane, glass there are MORE windows than ever—sometimes too many! 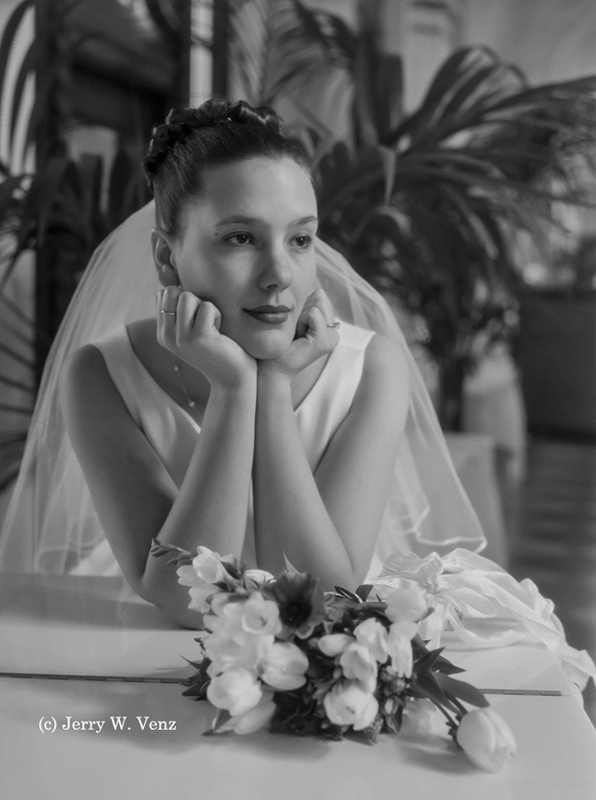 The bridal portrait below was done at one of our favorite hotels with a beautiful hallway next to an outdoor area separated by large windows. The hallway has a mirrored wall on the left and it also ends in a huge mirror—making this spot tricky to use. We set her up at the white grand piano (see second image) on the left side of the hallway probably 10-feet away from the windows. This is not what you should normally do; your subject should be as close to the window as possible to get the soft light that needs no fill. However, in this case the windows are so large that her light was great—we just got smaller catch-lights in her eyes because of her distance from the window. Then turning her head towards the light until I got that nice triangle of light under her left eye created the final touch. The added bonus is the “kicker light” on the left created by the wall of mirrors; neat! 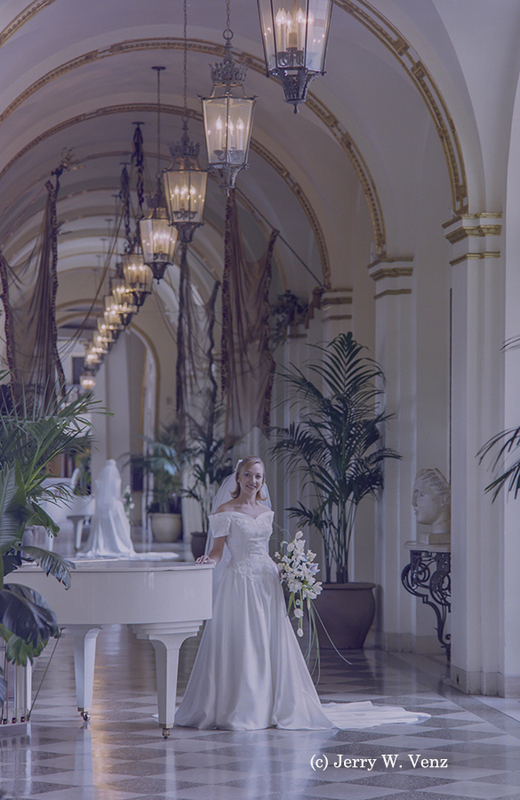 The image below, of a different bride, in this same location shows most of the hallway. Working with mirrors on two sides is tricky, but fun too. The downside is that everything and everyone BEHIND me (wedding party & hotel guests) walking to the hotel’s main desk would show in the hall’s end mirror. The cool part is that this is the one place where I could capture the back view and the front view of a bride at the same time! When our lab printed this image they called to ask about, “burning down the statue on the piano”, not realizing that it was the bride’s reflection! That was a pretty amusing conversation. ’Til next week…Anytime you have any questions please don’t hesitate to ask…. In the era of film we started with an Idea. Then with planning and selecting the best film, to create the look we wanted, we applied the best technique to create the image. 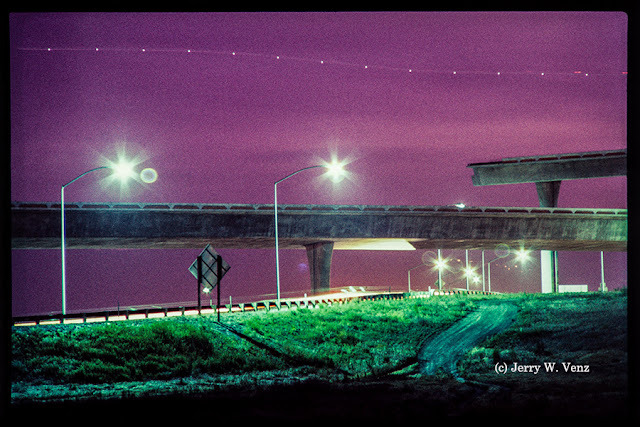 I had been photographing the famous uncompleted interchange for the 101-280 freeways, in San Jose, California, for some time, back in the late 1970’s. I considered it a modern, free standing, concrete sculpture! At the same time I had been experimenting with push processing (using an independent lab) with Ektachrome high speed daylight and tungsten slide films to 1000 ASA. This increased the low light capability, but more exciting were the artistic results because of the enhanced grain! I had found the color equivalent of pushed Tri-X; I Loved it! For this image idea I picked the Daylight Ektachrome because I knew that after the sun had set a long time exposure would create a purple sky for the background. And, since the San Jose Airport was so near (the landing flight path had planes passing over the freeway) I positioned my camera to include enough sky to capture the landing lights of any small planes that flew by. So, I set-up in the dark, camera on a tripod, that evening, and waited for a plane to venture into my field of view without too many cars driving by at the same time. A steady stream of car headlights, pointed towards my lens, for 30 seconds, was not pretty! It took a whole role of film (36 exposures) to get the one I liked. We were very frugal back then; my goal was to always get a great image (or several great images) on each roll of film! Hope you enjoyed…’Til next week…as usual should you have questions please don’t hesitate to shout out. So if you’re standing in front of a subject you want to photograph and you see NO shadows you’re in the wrong spot or it’s the wrong time of day; it’s that simple! Often, all I need to do is rotate my camera position 90 degrees from the flat light position or for real drama I’ll go to 180 degrees—it just depends on what I want people to look at and where I want texture versus how much shadow I want. Walking around in an old tractor salvage yard an hour and a half before sunset I saw THOUSANDS of possible compositions, but if the light was too direct, and I could not rotate around it, or move it, I passed on creating an image and kept walking. This first tractor was in a shaded area with some light filtering through a tree, so I started here because I knew its light would soon be gone. The basic “rule of thumb” being: shaded areas increase in size and intensity as the sun sets until all you have is a , flat, low level of illumination. 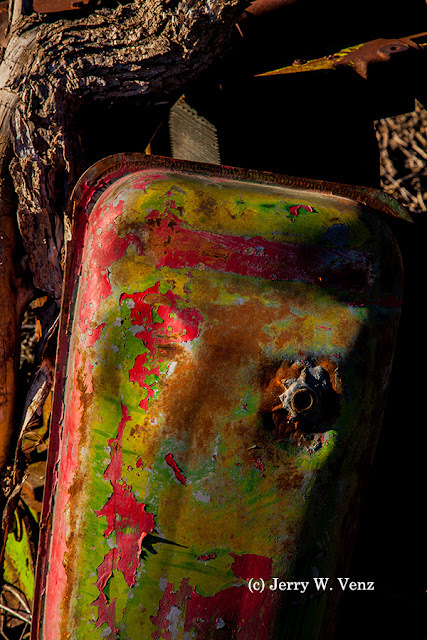 Next I found this old gas tank and, turning it over, found that the bottom, with it’s multi-colored pealing paint was the best subject. And, since I could MOVE it, I could create its best light by placing it so the setting sun skimmed the surface directly from the side (90 degrees from camera position). 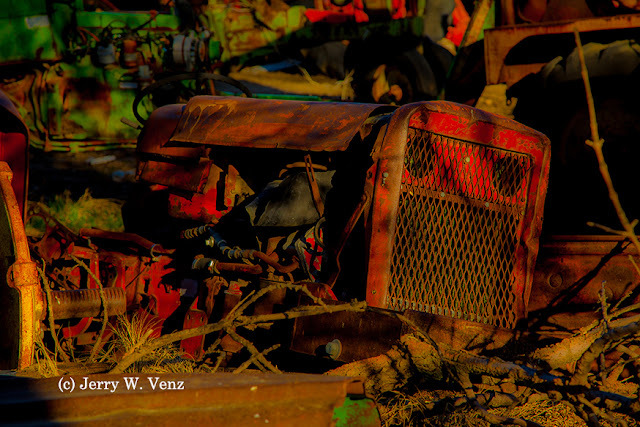 This image below is one of my favorites from this salvage yard. This old tractor is so beat-up and rusted that it reminds me of a broken-down old prize fighter, left drooling the corner after taking too many blows to the head! 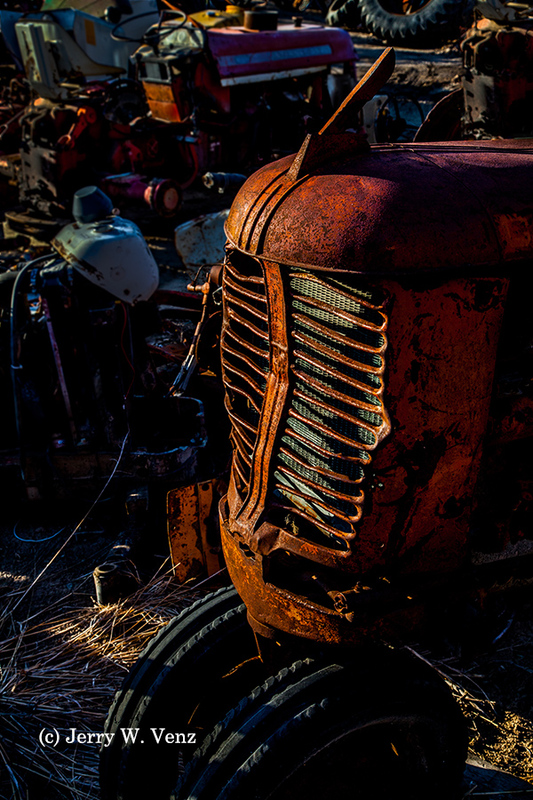 For this image I rotated my camera position about 130 degrees from the sun—I’m standing on the shadow side—creating what we call “Short Lighting” on the “face” of the tractor; very dramatic! “Short Lighting” is my favorite lighting pattern. I use it for portraits of people whenever I can because of its three dimensional quality. This basic lighting concept—using shadows to create three dimensionality—cuts across ALL types of photography It is one of the MOST basic tenets of art. 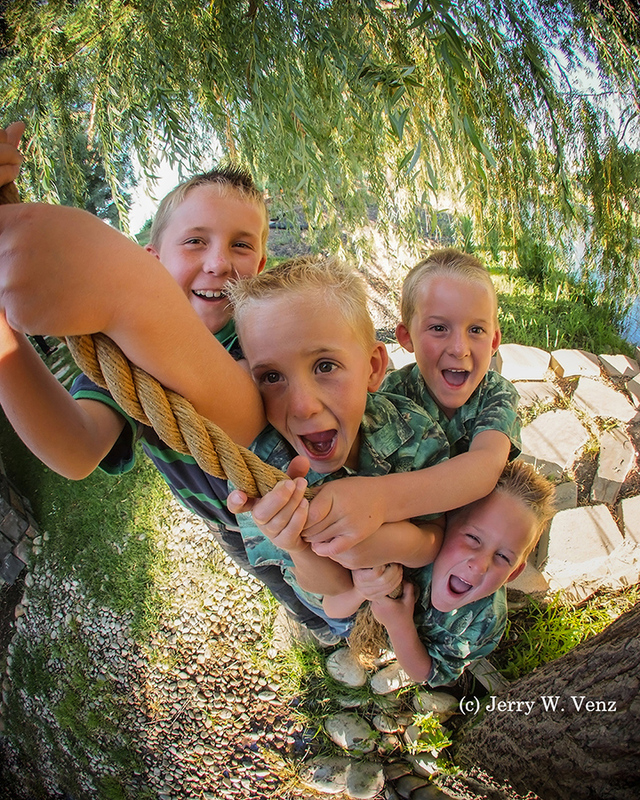 PHOTOGRAPHING CHILDREN IN THEIR NATURAL HABITAT! Doing portraits of children outside is one of my favorite types of photography. It has a less structured look then doing studio photography, but in either case, an individual child is always easier than a group of siblings. 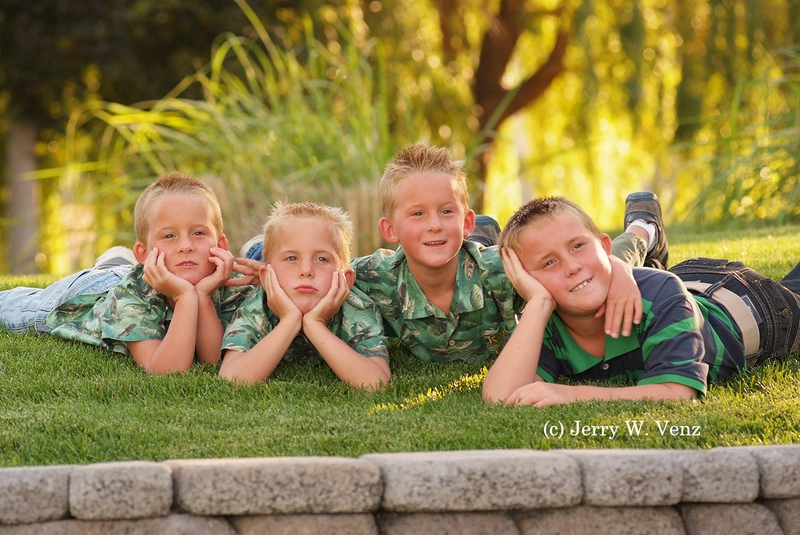 In this session we had four energetic brothers to photograph as a group outside…a set of triplets and the big brother. So, when I scouted the location—their grandparents’ backyard—I looked for spots on the lawn with nice backlight (toward sunset) for the traditional groups. Done; I knew I had the basics covered, but then I kept looking for a fun way to wrap up the session—fun, that is, for them and me! Then I noticed a big weeping willow tree behind the backyard shed. Upon investigation I found a large rope tied high-up in the three and hanging to the ground—perfect! We saved this image for last.. This image was done in my mind when I saw the rope! Using my 15mm fisheye lens I stood over the kids as they all hung for dear life on the rope with the tree wrapped around all of us. Actually they are standing on the ground…but that didn’t deter us from having fun. The only major edit Kathi did was to remove my feet from the bottom of the image! Yes, I have big feet, but in the vertical orientation with this lenses angle of view being 180 degrees anyone’s feet would be in the frame! Just before I tripped the shutter I said, “OK guys, grab onto the rope, you’re a hundred feet in the air and a tree gorilla is untying your rope! Everybody scream, Ahhhh!! !” Got it! Not too traditional in set-up and I like that each boy is being real, no cheesy smiles. ’Til next week…don’t forget if you have questions or comments don’t hesitate to ask.